While Britain’s coalition government is eager to spend more than £50 billion building hundreds of kilometres of very high speed rail line, its French counterpart has decided to wind down construction of new trackage, in favour of ‘les transports du quotidien‘; meaning, upgrading the legacy railway network, and improvements to dangerous roads. Following the Mobilité 21 commission’s review of national schemes, the Bordeaux — Toulouse extension of the ligne à grande vitesse Sud Europe Atlantique is the only high speed project to be progressed in the period up to 2030. The Norman and Paca LGV projects are now ‘ex-TGV projects’ intended to be built sometime after 2030 as neoclassic routes, having a linespeed of 200 to 220 km/h (i.e., 125 to 137 mph). Tops des priorités selon la commission, plusieurs grands projets routiers, comme le chantier concernant la route Centre – Europe Atlantique (RCEA) entre l’Allier et la Saône-et-Loire. Dans les priorités, il y a aussi la modernisation de nombreux “nœuds ferroviaires”, destinés à désengorger le trafic des trains de banlieue et des grandes gares. Ces chantiers, “ingrats mais nécessaires”, concernent, entre autres, la gare de Lyon et celle de Saint-Lazare à Paris, la gare Part-Dieu à Lyon ou la gare Saint-Charles à Marseille. “Il y avait des risques de congestion qui pouvaient réduire à néant les efforts de gain de vitesse”, explique Philippe Duron. A l’horizon 2030, le rapport ne retient la construction que d’une seule ligne à grande vitesse (LGV), l’axe Bordeaux-Toulouse. La construction d’autres lignes destinées aux trains à grande vitesse, telles que Paris-Orléans-Clermont-Lyon, Bordeaux-Hendaye, la fin de la ligne Rhin-Rhône et le barreau Poitiers-Limoges, est renvoyée après 2030. En revanche, les projets Paris-Normandie et Paca deviendraient non plus des LGV mais des lignes nouvelles, où les trains circuleraient de 200 à 220 km/h. Leur réalisation serait séquencée entre 2030 et 2050. Philippe Duron, of the Mobilité 21 commission, said that the 1880 kilometres of TGV track had left France’s rail network with a debt of 32 billion euro, and that could rise to 61 billion by 2025. The lines were “extremely expensive, and of dubious socio-economic efficiency”. In the HS2 Paving Bill debate, Kelvin Hopkins (Luton North, Labour) suggested upgrading the Chiltern Main Line (CML) as an alternative to building HS2. The core of all the problems of capacity is London to Birmingham and there is an alternative, which is to upgrade the route between Paddington and Birmingham Snow Hill via Banbury. That could double capacity between London and Birmingham, and also would go to a very sensible terminus at Paddington, which is of course on Crossrail. At the Birmingham end, Snow Hill is in the town centre. The station for HS2 will be away from the town centre, so much of the advantage of speed will be lost in extra transport from that station into the town centre, but Snow Hill is in the centre. That would be a great advantage. Electrification of the central section of the CML, between Banbury and Leamington Spa, is now part of the government’s Electric Spine project, so the do-minimum baseline for Chiltern upgrading has decreased. In the Chiltern Rail Package 6 concept, the West Midlands capacity uplift available would easily exceed 100%, even if Paddington (rather than Old Oak Common), were used as the London terminus. On the Bicester cut-off, restoring separate platform and through tracks at stations would provide significant capacity benefits. And for the first 30 kilometres out of London, and 20 kilometres out of Birmingham, intercity trains could run on their own tracks (separate from commuter services), by using historic railway land. Another way of enhancing passenger capacity would be to divert Southampton — Midlands railfreight onto the Oxford, Worcester and Wolverhampton railway. 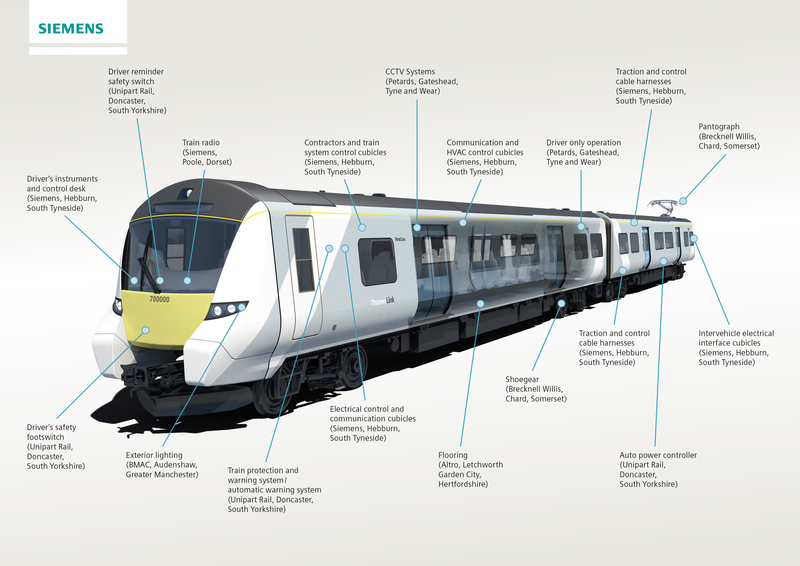 Siemens has released an infographic showing which components of its ‘Desiro City’ trainfleet, for the Thameslink franchise, are to be sourced from UK suppliers. Given the amount of controversy Thameslink’s fleet renewal has caused, one might have thought Siemens would pull a rabbit from a hat, and announce the appointment of Bombardier Derby as its sub-contractor to assemble the carriages. In the event, the coalition government has been very supportive of Siemens, and has backed its “2,000 jobs” spin. So the vehicle shells, bogies, and virtually all main sub-systems, are to be sourced from the Germanosphere, with assembly probably at Uerdingen. But the British economy will be proudly rebalanced by the manufacture of the driver’s safety footswitch. “My team will continue to be focused on control of costs“. In addition to the delays and the criticisms of the budget, serious concerns have also been expressed about HS2 Ltd. It was initially set up to advise Ministers on the route for the new north-south line, but the Government have expanded its role to include building support for the scheme and then delivering it, despite the fact that HS2 Ltd has faced criticism for the way in which it has engaged with communities along the route, with local authorities and with MPs. The fact is that it has not proved to be an effective advocate for the scheme. By divorcing the scheme from delivery of the investment in the existing rail network, there is a risk that we will not focus on the need to create a fully integrated single rail network. It makes no sense that Network Rail is, in effect, having to mirror some of the work of HS2 Ltd, including appointing staff of its own to work on the scheme and having to lobby HS2 Ltd to ensure that decisions are taken in a way that does not have a negative impact on the wider network. It is increasingly clear that a better option would be to transfer responsibility for the planning and delivery of the new north-south rail line to Network Rail. That would reduce duplication and cost while better enabling the integration of investment in the existing network and the new line. The decision to set up a separate HS2 company was taken by Andrew Adonis, presumably with a view to reducing the chances of the project being properly scrutinised. While HS2 Ltd’s planning, design, and communications have been terrible, it’s difficult to see how things would have been any better, had the project had been under the control of Network Rail. It is the HS2 scheme itself that is the fundamental problem. Shadow rail minister Lilian Greenwood said that suggestions that high-speed rail will only benefit London discounted “the growth we have seen in regional traffic”. From 2000 to 2010, passenger growth between Manchester and London was 70%, whereas between Manchester and Birmingham it was 105%. The problem with quoting percentage figures for rail travel growth between Manchester and Birmingham, is that the underlying numbers are very small. A large percentage increase of a very small number, is still going to be a very small number. In 2007, Network Rail produced a diagram showing inter-urban regional passenger volumes (below). Even with large compound growth rates, the numbers couldn’t possibly justify the construction of billions of pounds of limited-purpose HS2 infrastructure. (The diagram also reveals the absurdity of the Scottish government’s plan to build a high speed line between Glasgow and Edinburgh, where there are already four different lines in place.) In Scotland, England, and Wales, the way forward for inter-regional travel must surely be to plan development around the existing asset base (the Rail Package 6 concept). Another matter of concern for Ms Greenwood was that there had been “no information on the cost of tickets”. The new line cannot be a rich man’s toy; all fares must be subject to regulation on the same basis as the rest of the network. HS2 is high-cost, single-purpose infrastructure (it cannot be used for freight or local traffic), so having fares “subject to regulation on the same basis as the rest of the network” is likely to prove a difficult business for the government. Someone has to bear the additional energy and track maintenance charges incurred from trains running at very high speeds. At the moment, HS2’s massive capital costs are overshadowing the equally problematic issue of running costs and subsidies. For some time, the Beleben blog has been using £50 billion as a ballpark present value cost for Britain’s proposed HS2 Y network railway. But that figure may already be too low; the budget for the Y network has risen by nearly £10 billion to more than £40 billion, the transport secretary has announced. Patrick McLoughlin told the Commons the new projected cost of £42.6bn, up from £33bn, would include a large “contingency” fund. He said the final cost could be lower than the new estimate, but said revising the figure was “right”. […] The first phase budget is now £21.4bn, with £21.2bn for phase two. These figures include a contingency fund of £14.4bn across the scheme. Mr McLoughlin said contingency money was built into the London Olympics budget but the cost ended up “below the price that had been set by the government”. In the April 2013 issue of the Railway Gazette, HS2 Ltd chief engineer Professor Andrew McNaughton claimed that, as plans are finalised for parliamentary scrutiny, the margin of optimism bias would decline. So, previous estimates for the cost of HS2 already included very large amounts for contingency. But, instead of declining as Prof McNaughton claimed, a massive £10 billion of additional ‘contingency’ has been summarily dropped into the scheme without any real explanation. It’s clear that the construction cost estimates have been way off. And when rolling stock (~£8 billion) is added in, the official costs have breached the £50 billion mark. The lack of transparency remains deeply troubling. To maintain the pretence of HS2 having a benefit cost ratio above 1.0 with £10 billion of extra costs, it’s quite likely there will be a round of ‘creative reinterpretation’ of the scheme’s benefits. On 5 June 2013, Manchester University’s Centre for Research on Socio-Cultural Change (CRESC) published ‘The Great Train Robbery‘, an assessment of Britain’s privatised rail system. In the 1990s, the vertically integrated nationalised operator, British Rail, was broken into 120+ private entities. One of the most visible companies in the new order was the Richard Branson / Stagecoach train operating venture, Virgin Trains. This is a public interest report based on independent research into the railway sector from the Economic and Social Research Council (ESRC) funded Centre for Research on Socio Cultural Change (CRESC) at the University of Manchester. Karel Williams headed an intensive four month research project from October 2012 to January 2013 when the project’s full time researcher was Andrew Bowman. The salary costs of the project were funded partly from the Centre’s ESRC grant and partly by the TUC which considered there was a need for an independent, non-partisan academic review of privatised railways and an exploration of alternative models that might better suit the public interest. The CRESC researchers are solely responsible for the contents of the final report but they have benefited from TUC comments on a draft of the report. limited by time constraints and by our decision to concentrate on accounting data so that we could build the first complete picture of how revenue flows through a sector where profit is politically constructed. The accounting information on rail is opaque and dispersed across many sets of accounts, so that it is difficult to avoid error. As a quality check, we asked Jean Shaoul and John Stittle, two leading, university-based, independent accounting experts on rail, to read through a draft of this report. Our expert readers did not identify any gross errors: Jean accepts our empirics but differs on interpretation while John raised some matters of empirical detail which we have addressed; any remaining errors and omissions are, of course, entirely our responsibility. On 10 June, the Guardian’s Aditya Chakrabortty mentioned the CRESC paper in an opinion piece spanning Richard Branson’s business interests, and rail privatisation. [The CRESC report] boils down to one key finding: the only way Branson and the vast majority of train barons make their profits is through handouts from the taxpayer. And while you may know about the direct payments taken by Virgin and others, the Cresc team has also analysed another, indirect transfer from the public purse to private hands. By now, it’s worth £30bn – yet it is barely acknowledged either by Network Rail or Westminster. Just so there’s no doubt on the numbers, the Cresc report was shown to the Association of Train Operating Companies weeks before it was published. The trade body had time to dismantle the maths; but while it evidently doesn’t like the conclusions, it hasn’t repudiated the figures. Years of indirect subsidies have left Network Rail £30bn in the red. This is debt guaranteed by the public, although very few people know about it. What all this resembles is a looking-glass version of capitalism. The public are handing money to private businesses for them to take a clip and pay us back the rest. On 20 June, the Guardian published Richard Branson’s response. He claimed that ‘Hard work, not handouts, put Virgin trains on the right track’. Chakrabortty claims “the only way Branson and the vast majority of train barons make their profits is through handouts from the taxpayer”. This misrepresents why subsidies were paid in the early years of the west coast franchise, when it was heavily loss-making and costing the taxpayer a fortune. The subsidies were calculated by government to cover losses in those early years and ensure a regular service could be maintained while the track was repaired and before we could start turning around the franchise. From 1997 until 2004, Virgin Rail’s shareholders took no dividend. Instead we worked to create a reliable service, in spite of the collapse of Railtrack and huge delays in the infrastructure work, which severely slowed the turnaround. Chakrabortty confuses with his claims of “the service’s upgrade (worth around £9bn, and paid for by the public), and the fleet of Pendolino trains (again, largely subsidised by the government)”. Of the £9bn spent on the line, only £2bn was for upgrade work. The remaining £7bn was spent to renew a railway that had no investment since the 1960s and needed to be made safe. Contrary to the claim that the Pendolinos were subsidised and “most of the improvements were subbed by taxpayers”, the train fleet has been 100% privately financed and we pay Angel Trains and Alstom more than £200m each year to lease and maintain one of the most modern fleets in Europe. Network Rail has cut the overall track access charges from £3bn to around £1.5bn a year, but these are set by the government, and the west coast charges reflect a reduction in costs after the renewal and upgrade work and other efficiencies it has made. Chakrabortty says: “Private companies who don’t make a profit can simply walk away, dumping their service back in public hands.” By contrast we have stuck with the task despite the dreadful performance by Railtrack. Thanks to the hard work of our 3,000 staff, we have transformed this once-failing franchise into the success it is and proved the doubters wrong. […] The problem with Richard Branson’s operating company turnaround story is that it does not engage with our rather different and well evidenced subsidy ‘churnaround’ story. As the Great Train Robbery report explained, after 2004 as direct state subsidies in the form of cash grants to West Coast Trains and other operating companies declined, so the indirect subsidies in the form of low track access charges levied by Network Rail have increased. The rise of indirect subsidy is elliptically dealt with in Richard Branson’s article which accepts that national track access charges for use of infrastructure by train operating companies have declined from £3 to £1.5 billion . West Coast Trains track is a beneficiary of lower track access charges despite the fact that the company is running more trains with more passengers along a West Coast track that has been upgraded and renewed at cost of nearly £10 billion which was substantially charged to the taxpayer. and further comment from Mr Chakrabortty, describing the privatised rail industry as a ‘Potemkin market’. […] Virgin Rail is merely a player, a lobbyist and a big beneficiary of a terrible system, where Britons hand money to private companies who then claim to be running a profitable business while relying on a subsidy from us. Last week, we read about how the town of Fermanagh prepared for the upcoming G8 summit by sticking posters over its empty shopfronts to make them look bustling. Something similar is going on with the use of public money in the notionally private industry of rail: it’s a Potemkin market, nothing more. Branson’s reply is part of a sector’s attempt to duck this argument with the aid of bluster and selective facts. And since neither the government nor the train operators want to disrupt these secret handouts or to rip the veil away from our privatised system, it’s easier for the press not to probe too deeply. Yet poll after poll shows the public wants to take the rail network back into national ownership. That’s all the more remarkable, given the lack of support from major political parties (it’s left to Green MP Caroline Lucas to introduce a private-member’s bill calling for renationalisation), and the vacuum in the media where serious discussion of alternatives to the current mess should be. Far easier, I guess, to have a secret £30bn debt with our names on it. Transport authorities all over Britain have implemented park and ride (P&R) at railway stations, and at dedicated sites for bus services. By 2003, the West Midlands transport authority Centro had made P&R a key element of its 20-year transport strategy, and since then, it has spent millions of pounds on P&R. However, the benefits are dubious, and as is usual with Centro, there is a lack of transparency on the costs and usage of P&R sites. On December 23, 2004, the Birmingham Mail revealed that Centro’s bus based 1,000-space park and ride at Star City, Birmingham, was to close, having lost £200,000 in just a few months. Here’s Centro’s press release announcing the opening of Star City P&R. Motorists are being offered free parking and a shuttle bus to Birmingham city centre from early July as a way of avoiding the worry of motorway road works. West Midlands public transport body Centro is promoting the launch of a new park and ride scheme to provide welcome relief for commuters faced with contraflow on the Aston Expressway and M6 this summer. The scheme is a joint partnership venture between Centro, Birmingham City Council, family entertainment complex Star City and the Highways Agency and will operate six days a week – from 7am to 7pm on weekdays and 10am to 6pm on Saturdays. It is part of a regional park and ride strategy and had been expected to launch later in the year. Centro has also launched a dedicated website to help commuters planning to leave their cars behind but who are unfamiliar with public transport at http://www.centro.org.uk/beginner. Birmingham City Council will also be working on the Aston Expressway during July and August. Both organisations stress that the roads will remain open, but that contra-flow operation could cause delays and are advising drivers to plan ahead. The resurfacing and structural repair work is essential, says city council head of transportation strategy David Bull. “Disruption to traffic will be reduced by carrying out three sets of road works at the same time,” he explains. The good news for motorists is that from Saturday 3 July, Star City will make more than a thousand free spaces available at its secure car park close to Spaghetti Junction and just off the A47 Heartlands Parkway. From there a fleet of dedicated buses will ferry commuters and shoppers to Birmingham city centre for a return fare of £2 per person – which is less than the cost of most city centre car parking. The park and ride buses will be able to take advantage of bus priority measures introduced along the Lichfield Road by Birmingham City Council and which should cut the journey time to under 20 minutes. “Park and ride is a key part of the city council’s transport strategy and we hope commuters, visitors and shoppers will all take advantage. By making bus travel more attractive we can provide a better deal for passengers and cut congestion for the benefit of all road users,” adds David Bull for the city council. There are already more than 4,000 rail-based park and ride spaces serving Birmingham city centre. On 19 June 2013, Centro announced that its Coventry P&R North site is to close. A Park and Ride bus scheme in Coventry is to close after 14 years. Park and Ride North will cease operation at close of service on Saturday July 27 as a result of a steady decline in use. The service was based in Courthouse Green and was run by Centro and Coventry City Council, with services operated by Coventry firm Travel de Courcey. But the service will remain in operation to enable concert-goers to get to the Coventry Godiva Festival on July 5-7. Guy Craddock, Centro area manager for Coventry, said the decision to close Park and Ride North had not been taken lightly but it was losing money and current usage averaged just 2.8 passengers a trip. He said: “Even though the service is subsidised by Centro at around £1,900 per week it is still making heavy losses. “Surveys of the passengers who do use the service showed they would in the main either transfer to Park and Ride South or use another bus service into the city centre, so we are not likely to see an increase in car trips there as a result. Launched in 1999 the Park and Ride service was designed to relieve traffic congestion from the city centre, and to provide a more affordable alternative to city centre parking. People can park for free then catch a bus into Coventry city centre for the price of a return fare. Park and Ride North operates from a 163 space car park in Austin Drive. Park and Ride South operates from War Memorial Park, off Kenilworth Road, and will remain in service. Here’s the 1999 press release announcing the opening of Coventry P&R North. The launch of the second park and ride site in Coventry promises to be no minor affair because the new 163 parking spaces scheme is based on the former Morris Engines site which made engines for the world famous Morris Mini Minor. It seems only fitting therefore that for the launch of the new Park and Ride North facility the first car to use the site will be a 1957 Morris Mini Minor with an engine produced on the former site. The site will be officially opened on 23 April at 12pm at Austin Drive in Bell Green, where West Midlands Passenger Transport Authority and Coventry City Councillors Dave Batten and John McNicholas. The car park boasts tarmaced surface with clearly marked spaces including 8 orange badge holder spaces, lighting and CCTV. Travel West Midlands will operate the service from the site to Coventry City Centre providing single decker low floor easy access Volvo B6 buses. The buses will be painted in the old Corporation colours of maroon and cream and clearly marked as Park and Ride North buses. This scheme is being joint funded between Coventry City Council and Centro. The service will open to the public from Monday 26 April and will operate Monday to Saturday. The first service from the Park and Ride car Park will be at 0745 (0800 Sat) and then every 15 minutes until 1800. From the City Centre the first service will be at 0758 (0813 Sat) and then every 15 minutes until 1813. The journey time will be approximately 13 minutes. There will be no service on Sundays. Return fares are as follows: adults £1, children (under 16) 50p, Centro Concessionary pass holders * free and Non-pass holding OAPs* 50p (*only during 0930 ad 1530 Mondays to Fridays and all day Saturdays – at all other times normal adult fares apply). For further information contact Centro Hotline on 01203 559559. “I am delighted that we are opening a second Park and Ride service in Coventry and I am confident it will be as successful as the Memorial Park site. People will benefit from a short journey time and drop off and pick up points in key areas in the city including Queen Victoria Road, Earl Street and Corporation Street. The first park and ride site is at Coventry Memorial Park (South) and opened in 1988. Despite its economic and environmental shortcomings, P&R is still being pursued by Centro and other transport authorities. For example, in Leeds, P&R is a key element of West Yorkshire PTE’s flawed New Generation Transport project.